Political science Prof. Wendy Pearlman speaks about her book at the Evanston Public Library on Monday. Pearlman interviewed more than 300 Syrian refugees for the book. 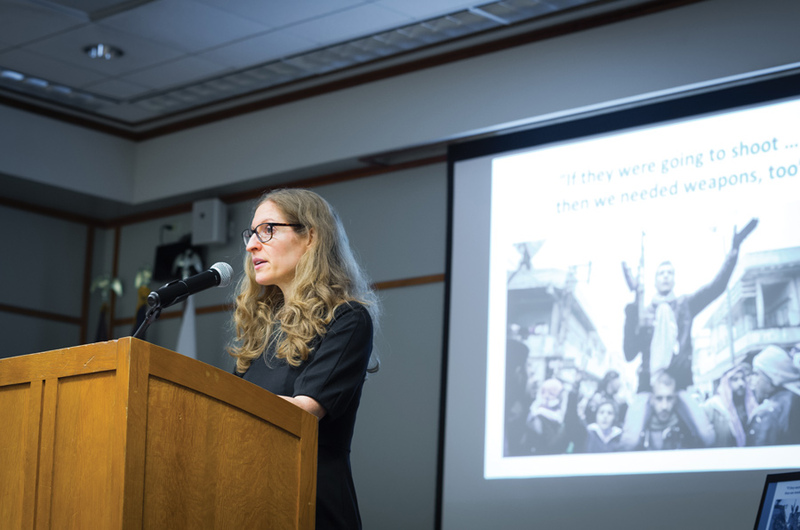 Political science Prof. Wendy Pearlman discussed her book, “We Crossed a Bridge and It Trembled: Voices from Syria,” and her experiences interviewing refugees during an event at Evanston Public Library on Monday. For her book — which was featured on the cover of The New York Times Book Review in July — Pearlman interviewed more than 300 Syrians during times of mounting political tensions and war. Aside from an introduction, the entire book is composed of direct quotes from Pearlman’s interviews. Pearlman said she was able to connect with refugees by speaking to them in Arabic without a translator. She said looking people in the eye helped her understand their emotions. Throughout the various stages of the Syrian conflict, Pearlman said the refugees she interviewed expressed fear, anger and hope. English Prof. Brian Edwards said Pearlman shows great dedication to her work. While introducing Pearlman, Edwards, who is the director of the Middle East and North African Studies program, said he finds Pearlman’s work ethic admirable. “(The book’s) topic and, more importantly, the way she went about it — the years of research, incredible language skills and intrepid field work — (are) just tireless efforts in bringing together the voices of so many Syrians in so many countries as they fled from the devastation of their country,” Edwards said. Pearlman said there were times when she distanced herself from hearing such tragic stories. She said sometimes she would take breaks for months, giving herself time to put the work away and step back. Despite the tragedy that has befallen many Syrians, Pearlman said her interviewees were still able to share positive stories with her. “It’s awe-inspiring, every day and every conversation that I have with Syrians, what they are able to continue to do in spite of the loss and the pain they carry with them,” she said. Second-year graduate student Uli Nastiti told The Daily she was so impressed with the talk that she wept throughout it.